On June 11, almost 30 delegates from British universities came together at the one-day workshop “Something to talk about: Integrating content and language study in higher education”, organised by Elisabeth Wielander on behalf of the Centre for Language Education Research at Aston (CLERA) and hosted by the School of Languages and Social Science (LSS) at Aston University. The event was funded by the Higher Education Academy as part of the discipline workshop and seminar series, in association with the AHRC. 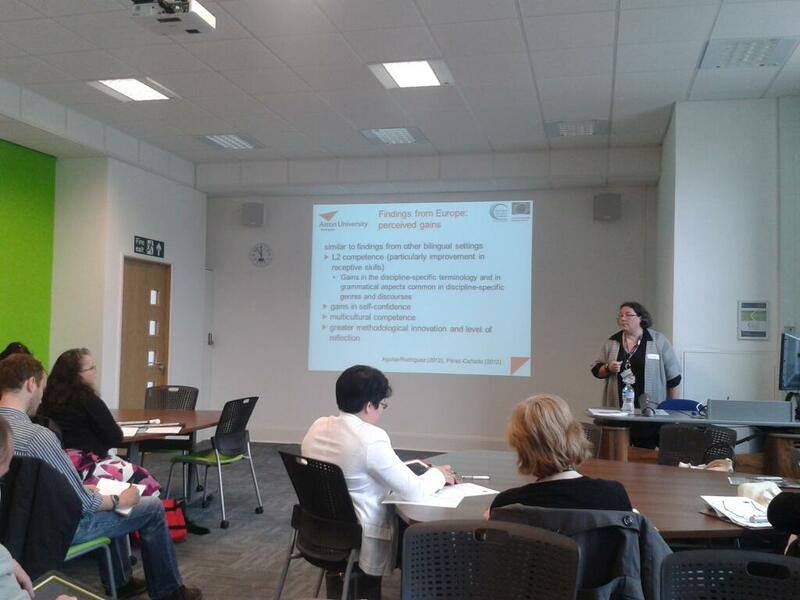 The aim of the workshop was to disseminate findings from the organiser’s own PhD research, based on results from international research efforts, to outline the possible benefits of Content and Language Integrated Learning (CLIL) in MFL degrees in UK Higher Education. It provided a platform for sharing practice in subject-specific content teaching through the target language and discussing implications for curriculum design and teacher training. In the morning session, Elisabeth introduced the participants to CLIL, building on findings from its predecessor, Canadian immersion, and tracing the development of this European form of bilingual education since the term was coined in the mid-1990s. After presenting some European research investigating the gains and losses of content instruction in a second language (L2) as perceived by university students and instructors, Elisabeth then shared some findings of her own PhD research into the use of German as a medium of instruction in UK undergraduate programmes and showed how Aston University is implementing this teaching approach, which has been in use since the 1970s. After lunch, two colleagues from each of the languages offered at degree level at Aston – French, German and Spanish – talked about their experience with L2 content teaching and shared examples from their teaching practice. The subsequent Q&A discussion raised some intriguing questions regarding the reasons why some universities embrace L2 content teaching, while others remain reluctant. The Powerpoint presentations and handouts used on the day will shortly be made available on the HEA website and blog. The Rey Juan Carlos University of Madrid and the Department of Education, Youth and Sports of the Madrid Regional Government will host the III International Conference on Bilingual Teaching in Educational Institutions to be held at the Rey Juan Carlos University (Vicálvaro Campus) in Madrid on the 18th and 19th of October, 2013. Bilingual education is growing in different educational systems across Europe. In the multilingual society in which we live, preparing our young people for their future studies and professional life is a decisive issue. Content and Language Integrated Learning (CLIL) has become a necessary instrument for confronting this challenge. The III International Conference on Bilingual Teaching in Educational Institutions titled: “Bilingual Education: Consolidation and Perspectives for the XXI Century” aims to go deeper into and move forward in the analysis of bilingual education. The conference is of special interest for primary, secondary and university teachers, researchers and policymakers committed to bilingual education. The registration period is currently open and available on the website www.cieb.es. Abstracts (not exceeding 400 words) should be sent before July 8th,2013. The international conference “Integrating Content and Language in Higher Education” took place at the University of Maastricht, Netherlands, on 11-13 April, 2013. This was the third conference of its kind (after previous events held in 2003 and 2006) and, like its predecessors, it focused on how the integration of specialist content learning and language learning affect universities and other institutes of higher education worldwide. In the years since the Bologna Declaration of June 1999, there has been a surge in undergraduate and graduate degrees offered in other languages – most notably English but also, if to a lesser degree, other languages. The findings presented at this conference are a reflection of the growing research interest in how the integration of discipline-specific content and (second or foreign) language learning is achieved in practice and what the implementation of ICLHE means in terms of education policy (on the international, national, regional, local and institutional level), theoretical and research frameworks, discipline and language pedagogy, teacher training, and student experience. policy: how local, regional, national and supra-national policies shape the design and implementation of the integration of content and language in higher education. On Thursday, Prof Cecilia Jacobs (Stellenbosch University, South Africa) talked about “Mapping the terrains of ICLHE: a view from the south”: After setting the scene by discussing frameworks, key concepts and contextual agendas of ICLHE, she called for the abolishment of what she called ‘the dichotomy of language and culture’; instead, she proposed to put knowledge – and the knower – at the centre of ICL pedagogy. On Friday, economist Prof Franҫois Grin (University of Geneva, Switzerland) spoke about “Foreign language skills, ‘linguistic work’ and the economic theorie of value”. First, he discussed the personal, social and national value added by multilingualism based on the example of Switzerland before turning to issues of internationalisation in HE. Specifically, he expressed concern about the unquestioned dominance of certain languages (often English, but not always) as medium of instruction, the possibility of ‘deliberate linguistic imperialism’, and some of the ‘negative value of internationalisation’. In his view, world language governance is needed, and he called for a ‘Linguistic Kyoto’ to be established. 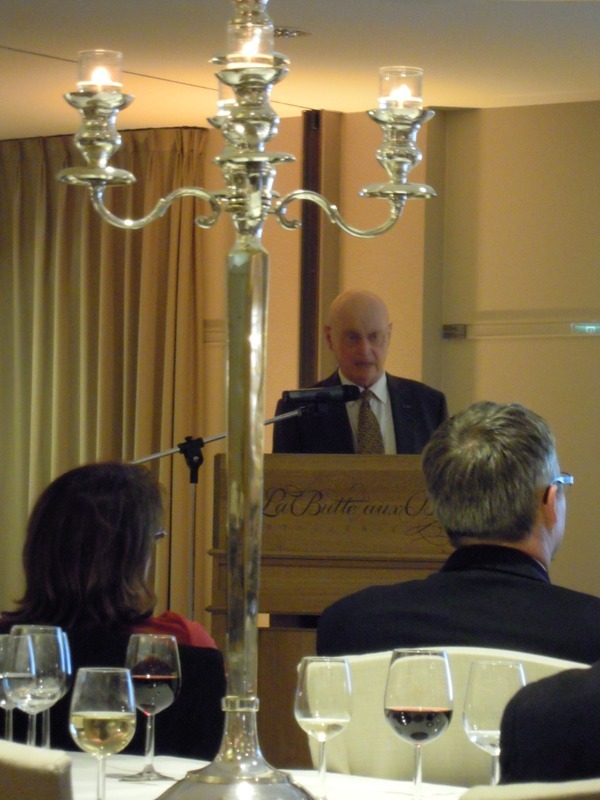 At the conference dinner on Friday, April 12, Prof em. Geerd Hofstede (right), who has a long affiliation with the ICLHE conference series, gave a talk about the “Seven Deadly Sins in a Multicultural World”. A long list of speakers from Europe and beyond – early-career researchers, practicioners, and leading experts in the field – presented insightful papers about a wide range of issues relating to the integration of content and language at tertiary level. For a full list of abstracts, click here. CLERA member and postgraduate researcher at Aston, Elisabeth Wielander, presented a paper titled ‘CLIL in UK Higher Education: Converging with and diverging from European models’ (abstract). And finally, on April 11, 2013, the ICLHE Association was officially founded and its constitutive board elected. This workshop – organised in association with the Arts & Humanities Research Council – draws on international research to outline the benefits of Content and Language Integrated Learning (CLIL) in MFL degrees in UK Higher Education. It provides a platform for sharing practice in subject-specific content teaching through the target language and discussing implications for curriculum design and teacher training. This workshop – one in a series of research-led CPD events run by the Centre of Language Education Research at Aston (CLERA) – provides an opportunity to discuss the potential of CLIL as a pedagogical instrument in UK Higher Education, to share experiences with target-language subject teachers, and to investigate the practical implications of introducing or expanding content provision through a MFL. In talks and group discussions, the workshop explores the methodological framework of CLIL, benefits of integrating content instruction with language study, and implications regarding curriculum design, teacher training and student support. Aston instructors of French, German and Spanish provide examples of CLIL in practice and present selected materials from their undergraduate modules. To learn more, go to the conference website. The Consejería de Educación en el Reino Unido e Irlanda and Liverpool City Council are inviting interested parties to attend the Consejeria’s Annual Seminar “En español, ¿por qué no? – Delivering the curriculum through Spanish” which will take place on November 30th at Hall 12, Arena and Convention Centre, Kings Dock, Liverpool Waterfront, L3 4FP. The Seminar is free of charge, funded by the Consejería. At the event, experts and professionals from Spanish Sections in schools in Liverpool and Cumbria will review and debate the integrated learning of Spanish through curriculum content. Click here to view the event website and to book a place.